Creating an escape for yourself doesn’t have to entail some grand plan, some grand vacation, or be a huge undertaking. When you can’t actually get away on a vacation, doing little things to evoke the feeling of escape, peace, or calm is the next best thing. With so many responsibilities, like being a Mom of two young kids, having a full-time job, running a décor blog and all the things that come along with those, I know that I am not alone in that getting even a moment to yourself is a blessing. Whatever keeps you busy in your life, whatever your responsibilities, taking time to relax, or to be still, or to be calm should have some place in your life. Sometimes, if I am being totally honest, even being in the bathroom by myself can seem like a blessing, but that doesn’t really count as an escape. I recently did a self-imposed organizing challenge where I committed to organizing 5 spaces in 5 days. While it was a lot of work, the feeling of calm that it evoked for me after was so great! Because we are all so busy, we let things pile up, and sometimes don’t even realize how bad it has gotten. In my case, when it was a struggle to close the drawer in my bathroom because of all the stuff, this was a sure sign that it was time to take action. 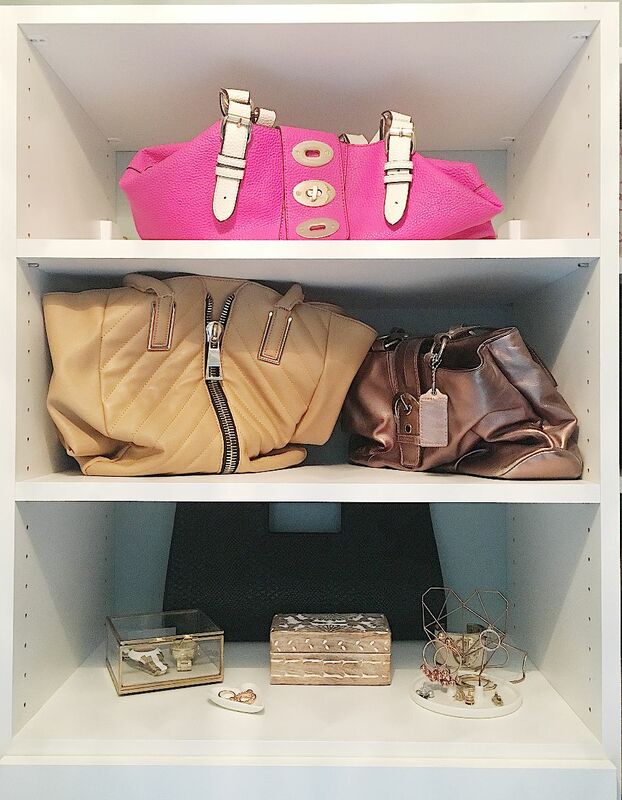 Now, when I go into these organized spaces every day in my home (master bedroom closet, bathroom drawers and cabinets, my kids bathroom linen closet), I truly have a feeling of calm because the clutter is gone, everything is organized, and I can find what I need for my daily tasks. Now, if I could only get my kids to keep the playroom organized! Here are a few pics of some of the spaces that I organized. I won’t bother you with the messy before pics! 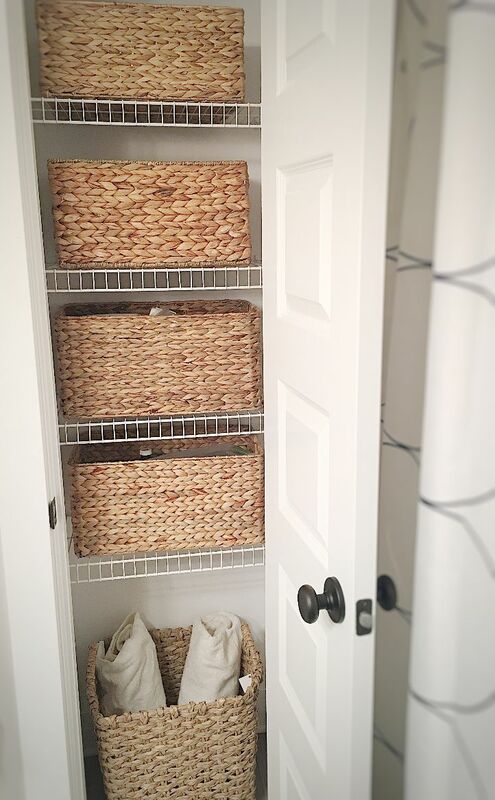 A side organizing tip: If you don’t use baskets to organize the smaller things, you are missing out! Another small, yet impactful thing that I do every day to make me feel at peace, or calm, is to make my bed. For some reason, having my bed made puts me at ease. If the bed is unmade, (kind of like living with the clutter), I feel a little disheveled. One thing that I tell people is to find small things that you enjoy that give you peace, or the feeling of an escape, even if it’s for a short time. 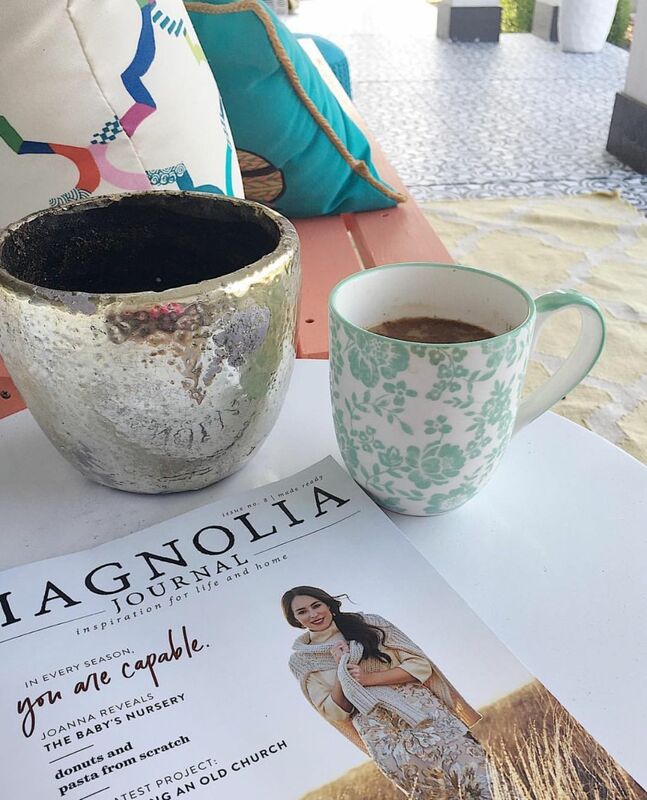 One thing that I like to do on a Sunday morning is to make a cup of coffee, sit on the front porch, and read a magazine. This doesn’t happen often, but when it does, it feels so luxurious. I am sure that you can think of a few things that give you peace, make you calm, or create an escape in your home. It may be organization, it may be a cozy spot to curl up and read a book, or it may even be hiding in a room if that’s necessary. Finding a way to do some of these things are good for the soul, and good for your sanity! 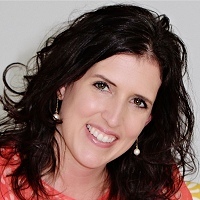 Laura is a home decor blogger, marketing professional, mother of 2, living in Michigan. 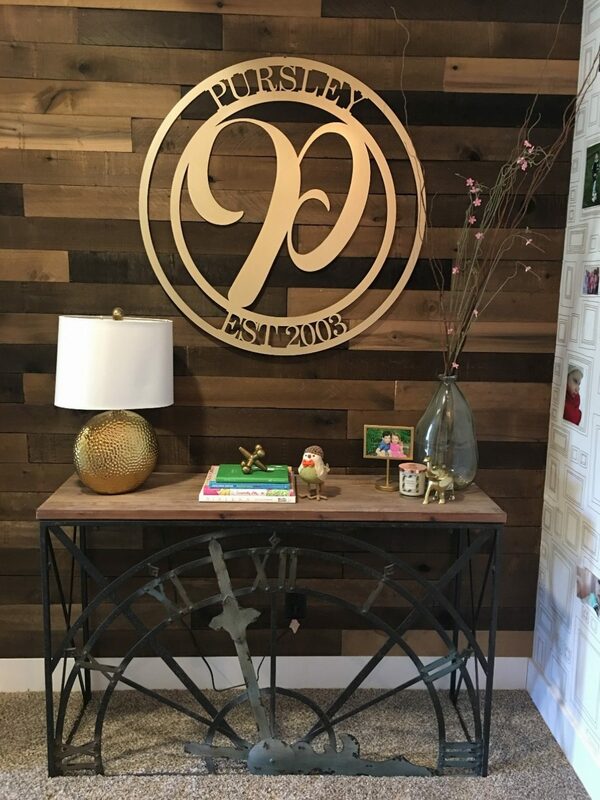 Laura has a passion for design that she uses to transform her home into a comfortable, livable, beautiful space for her family. Her design motto is that you don’t have to be a designer to have good design in your home. She believes that everyone deserves to be in a space that they love, whatever that means to you. 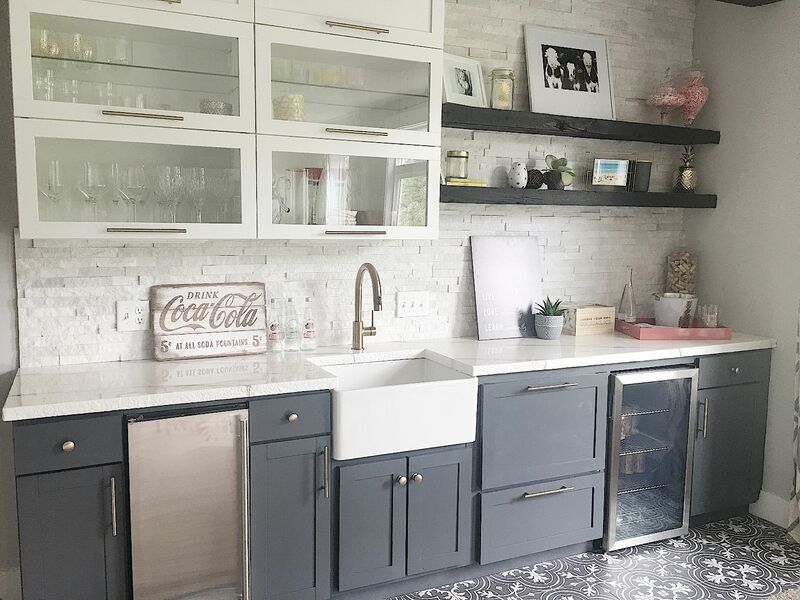 Laura likes to mix a little bit of modern with a little bit of farmhouse, and she likes textures, patterns, and in some instances, is not afraid of color. 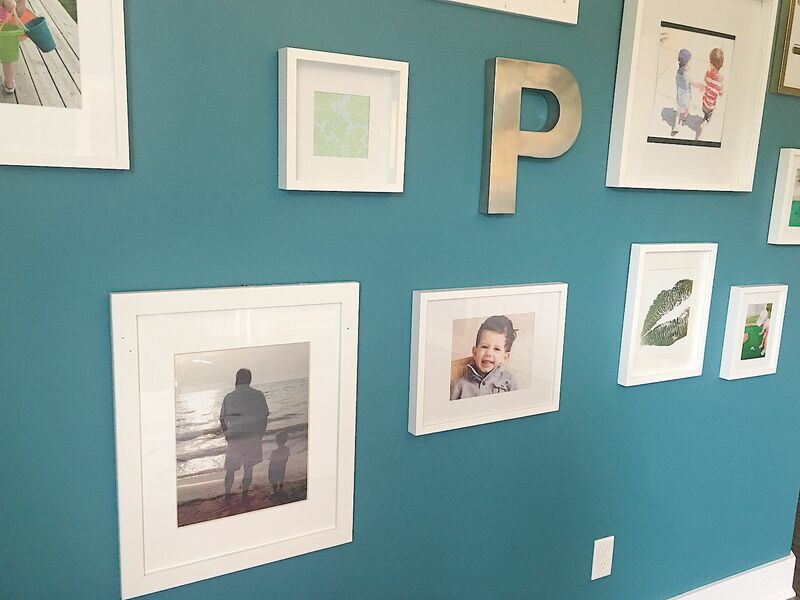 It is her hope with her design blog to inspire others to transform their own spaces into something they love. Escape…. We all need to be able to escape, to relax and recharge from our busy lives. Actually doing it can be very challenging, especially in this day and age where everyone is connected 24/7. Information is at your fingertips at all times, and there are more and more demands put on us, or we put them on ourselves. Summer is often a time when people slow down, spend time with family and friends, and enjoy the sometime short lived beautiful weather (depending on where you live). Some are able to take vacations to escape for a short time. The trick though, is finding that feeling of escape in your daily life so it’s not just a one-time thing. 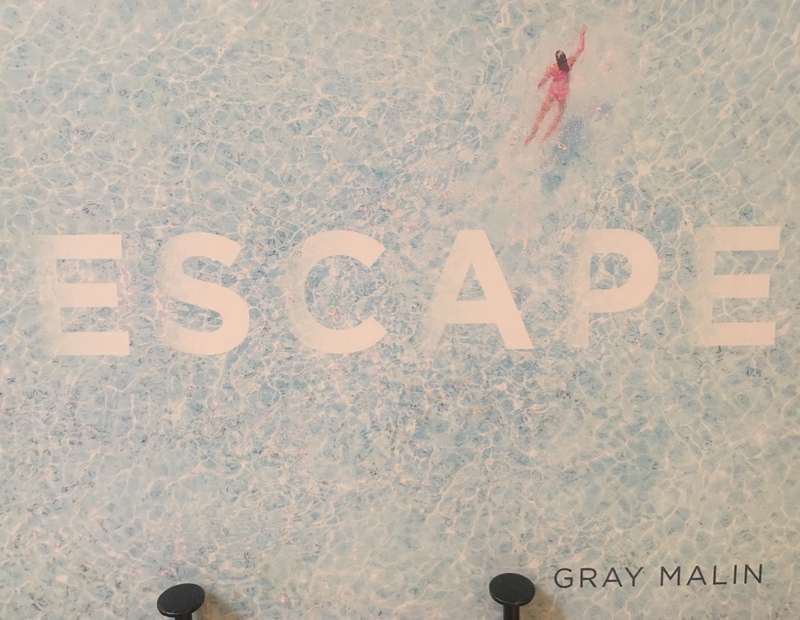 One of my favorite artists/photographers that epitomizes the feeling of Escape is Gray Malin. So much so that his latest book is named “Escape” and is full of beautiful beach pictures. Even if you can’t go to all of these beaches, just looking at these beautiful beach pictures immediately gives you the feeling of escape. Not everyone is able to take a beach vacation, and even if you do, it can be short lived. The secret is finding a way to escape on a regular basis to really be able to recharge. If you can’t take a beach vacation, but still want that feeling of escape, here are a few ways you can do this. One way is to create this same feeling of escape in your own home, in your daily life with your home décor. 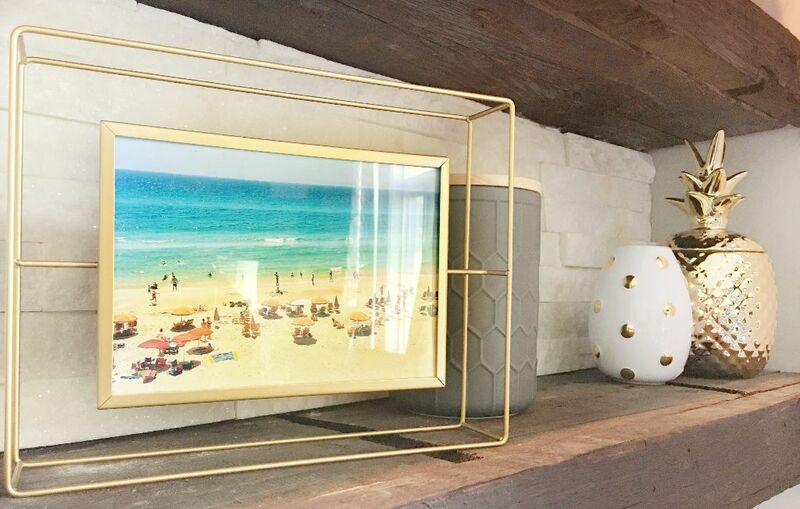 Adding décor to your home that reminds you of your travels with pictures or mementos, or decorating rooms in your home that evoke the feeling of your favorite places can create the escape that you need. Here are some examples of what I’ve done to create an escape for myself in my own home. 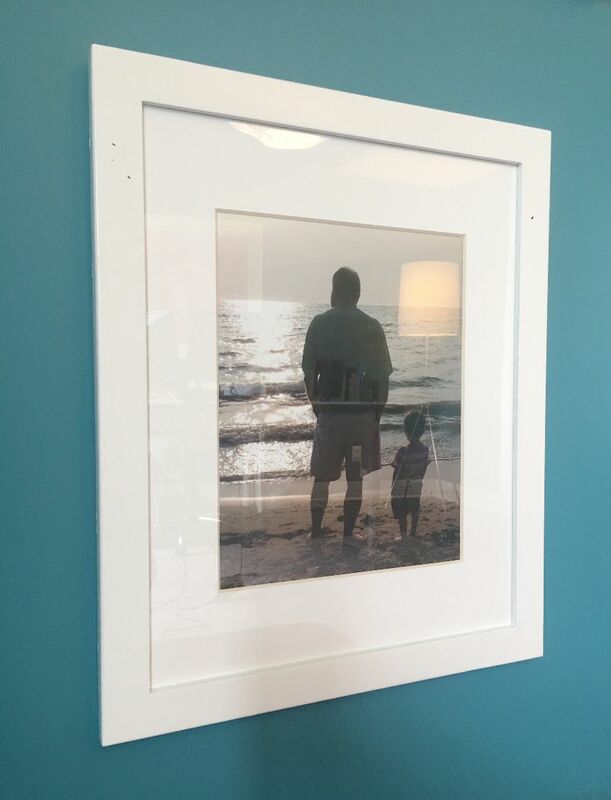 The first way is to use pictures from vacation to create décor/art. 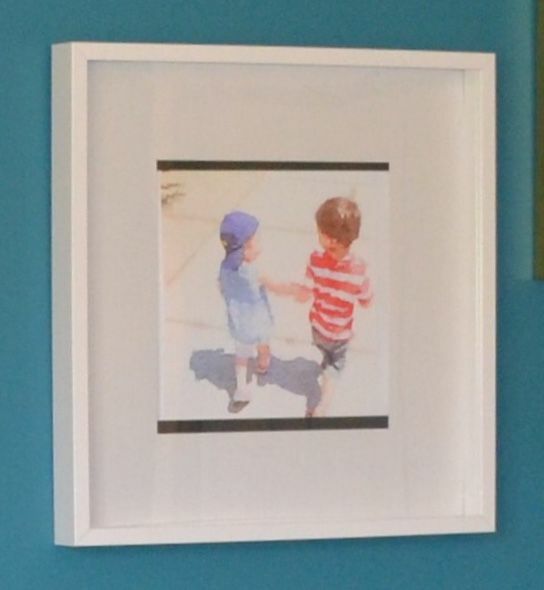 You can either enlarge special pictures and frame them, or use some easy apps to create a unique piece of art. Here are a couple examples that I added to a gallery wall. Here is an up-close view of this dear moment captured with our son and his Papa on the beach, watching the Northern Michigan sunset, pondering life. It is now part of a gallery wall in my office, that I see every day. 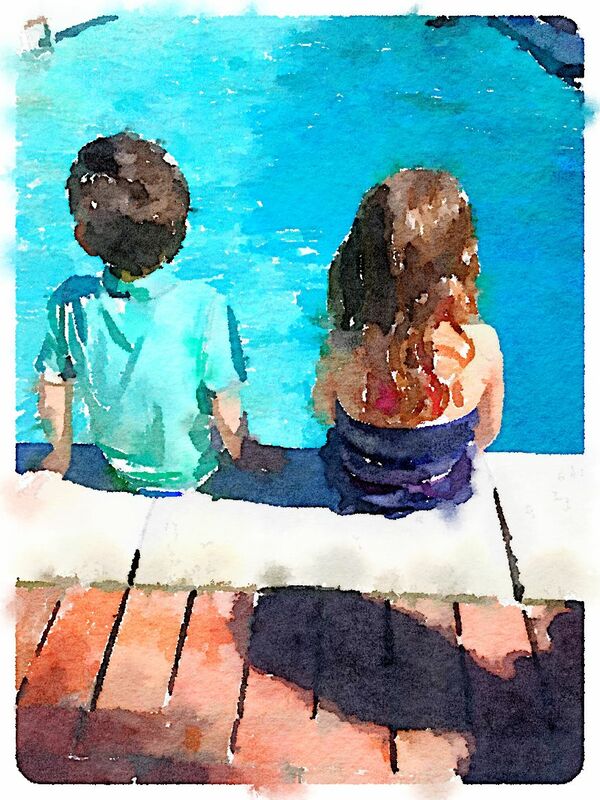 Another example is a sweet moment between my two kids captured on the same vacation in Northern Michigan, and I turned into a watercolor (using an App called Waterlogue). 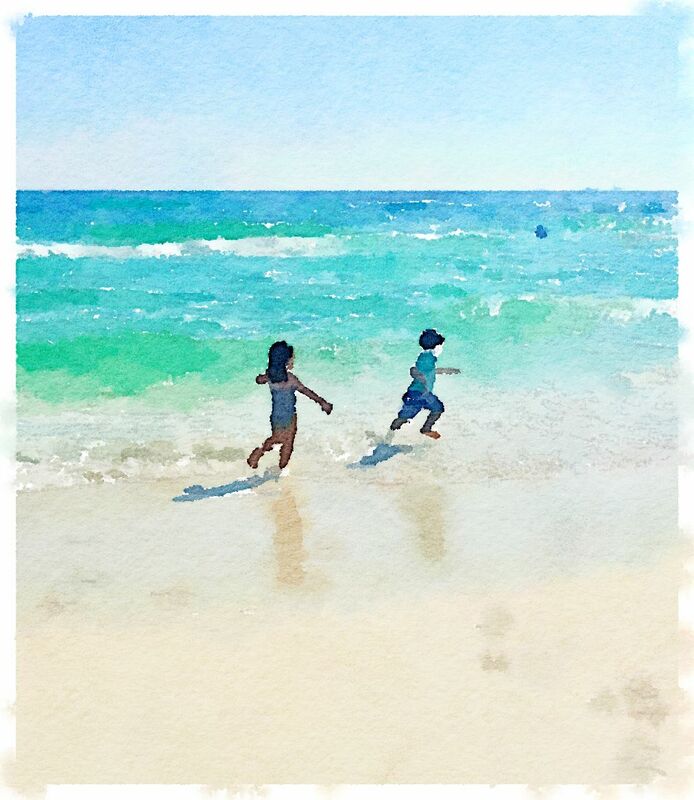 Here are a few more examples of how you can turn your family memories into artwork using an easy free app. Just looking at these images brings me right back to that specific vacation. Another way to create an escape is to think about your ultimate vacation destination and what this might look like. For me, I love the beach, and my ultimate beach house (if I had one) would consist of a lot of white, some blues, some natural elements and have clean, wide open spaces. So, I have incorporated some of these elements into my home. Here’s an example of our wet bar in our basement. 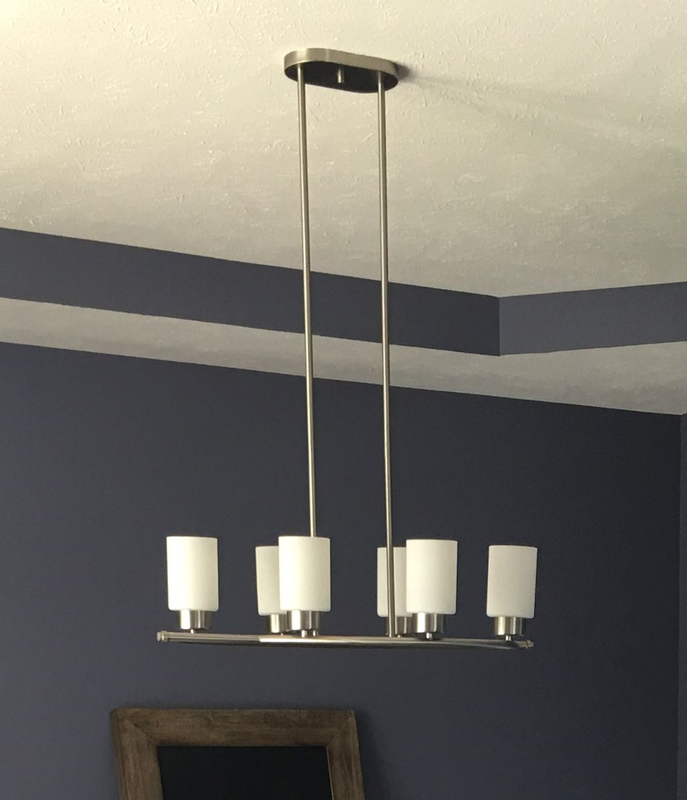 Here, in our wet bar in the basement, I used a lot of white, clean simple lines, and natural elements in the beams to create a calm setting. Being in this area just makes me happy. You can also see that one of the items on the shelf is the framed picture from our beach trip this year. Being in this room makes me feel relaxed and clam. If I choose to, I can escape from my responsibilities or I can do work in a calming atmosphere. One of my favorite things that Oprah once said was “your home should rise up and meet you, it should be your sanctuary”. (I may be paraphrasing a bit). But, I couldn’t agree more. 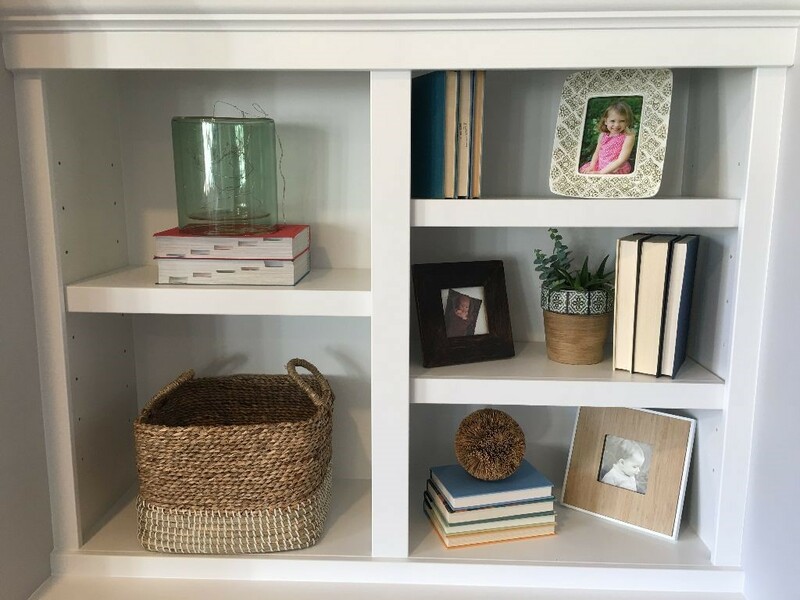 You should create spaces in your home that you love, that can be used as an escape and incorporating special things from your travels or just things that remind you of what you love is a great way to do this. Even if they are small, subtle things, they all add up to create a calm, relaxing space that you love. We can all get caught up in our crazy busy lives, but if you can find your escape, it will do a lot for your happiness, and your sanity! Décor can be a powerful thing, and can create a feeling of escape, without even taking a vacation! Every space in your home evokes a feeling. It can either evoke a good feeling, or a bad feeling. Consider this; if you walk into a room, and it is filled with clutter, your eyes don’t know where to land, you are overwhelmed with all of the images that your brain is trying to process, and eventually you are going to have a feeling of anxiety. On the other hand, if you walk into a well-organized space, that has function and is aesthetically pleasing, you may get a feeling of calm or a sense of happy. I feel both of these feelings when I walk into my kids playroom, depending on the state of chaos in the room at the time. Either a feeling of anxiety if there are toys all over the floor, or a feeling of calm if it’s clean and organized. Using design to change up the function or look of a space can also help to evoke the feeling that you want for a space. The difference between just existing in your space, without considering your surroundings, and thoughtfully creating a sanctuary, a space you love, is astounding. Even making small changes in a space can have a big impact. Here is a space in my home at the bottom of the stairs in the basement. 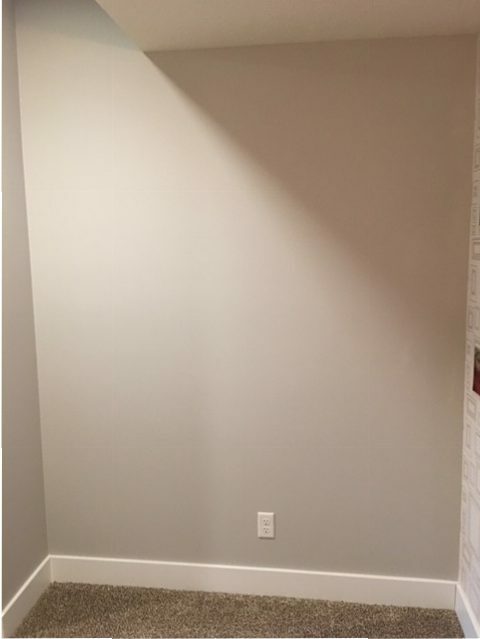 The “before” is basically a blank wall. A blank space does nothing to inspire, or evoke a happy feeling. The nook, after. With a little focus, some texture on the wall, and some accessories, it’ now a focal point when walking down the stairs! Talk about a mood changer! Now, the feeling that I get when I walk down the stairs is a pleasing, happy feeling. I am sure everyone has spaces like this in their home, and you probably aren’t even aware of how a space like the “before” affects how you feel. We get so used to our surroundings and don’t think that we have the power to cultivate a more beautiful space, but really even small changes can have a big impact! Your home should be your safe haven, your happy place. You spend a lot of time in your home, you deserve to love it. Using design or decorating your home can have an impact on how you live, your mood, your attitude, and your lifestyle. It doesn’t have to take a lot of money or time to create a space that you love. And, you don’t have to be a designer to have a great space. What this looks like will be different for everyone, and you have the power to cultivate the space that’s right for you. In other words, you do what’s right for you, and don’t feel intimidated or feel that you have to do anything to please others. If all you do is buy things to follow the trends, you are decorating for other people, not yourself, and ultimately you may end up not liking the changes. I talk to a lot of people that want to have a warm, welcoming, pleasing home, but just don’t know where to start or what to do. They also may think that it takes a lot of money, but I have seen people transform their spaces with small changes, adding old vintage finds, repurposing items, or tweaking a space with small changes. 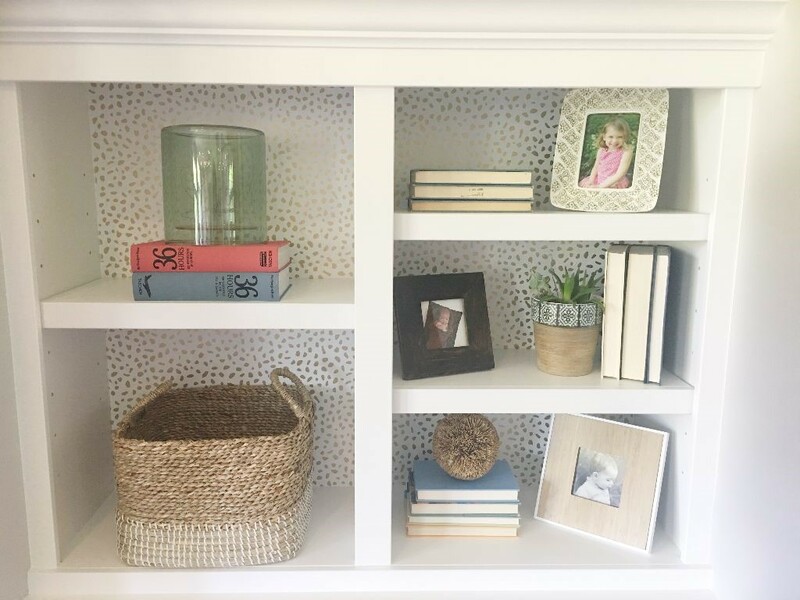 Adding texture (with wood or wallpaper), or color (paint or accessories) is another easy way to transform your space and make it feel more welcoming. You would be amazed what one small change can make. Here is what my shelves previously looked like. I liked what I had on the shelves and was happy with how they looked, but felt I wanted to jazz them up a bit. All I did was add some temporary wallpaper and now they have a whole new feeling. It only cost $30 and a couple hours of work. And, in case you were wondering, I am definitely not a DIY person. If I can do it, anyone can. It’s not about having more “things”. Randomly buying things to fill your home is not going to give you a feeling of peace, or satisfaction. It’s better if you buy things that have meaning for you, or speak to you in some way, or give you that feeling that you want your home to have, whatever that is. And even better is doing this over time, so it’s a true reflection of you. Sometimes you may make a wrong choice. It’s ok. It’s going to happen. One example of making a wrong choice, was when we were building our new home. We used a builder that had a certain number of floor plans to choose from, and you have to make all of your design choices in two meetings. Talk about daunting! There are good things about doing it this way and not so good things. What’s hard about this is that you are making choices without seeing how they will look together. It’s much better if you can build your home’s story over time and let your space evolve, but we didn’t have this luxury during this process. 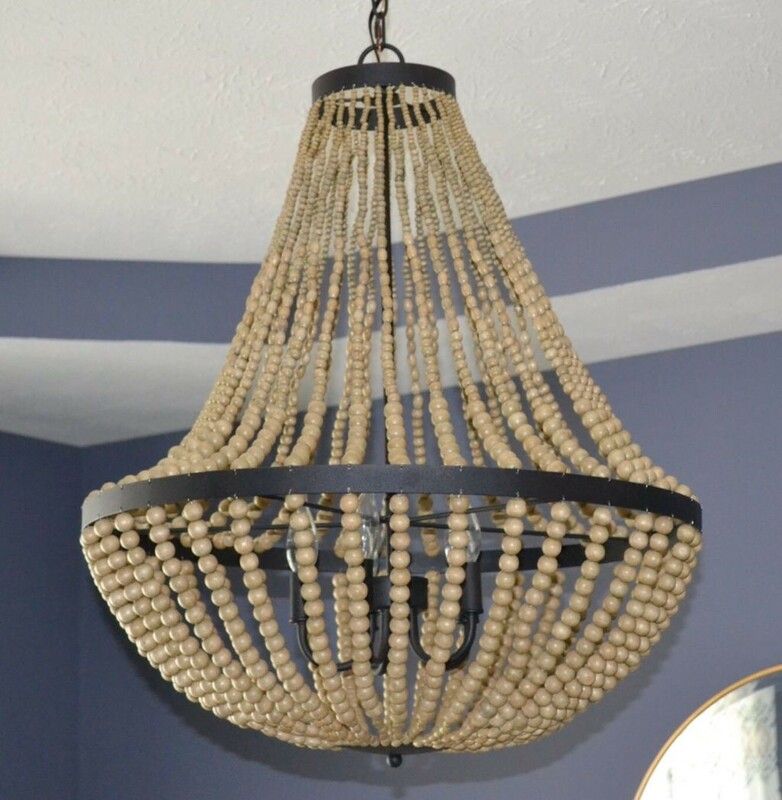 One of the choices that we had to make was to choose all of the lighting fixtures. 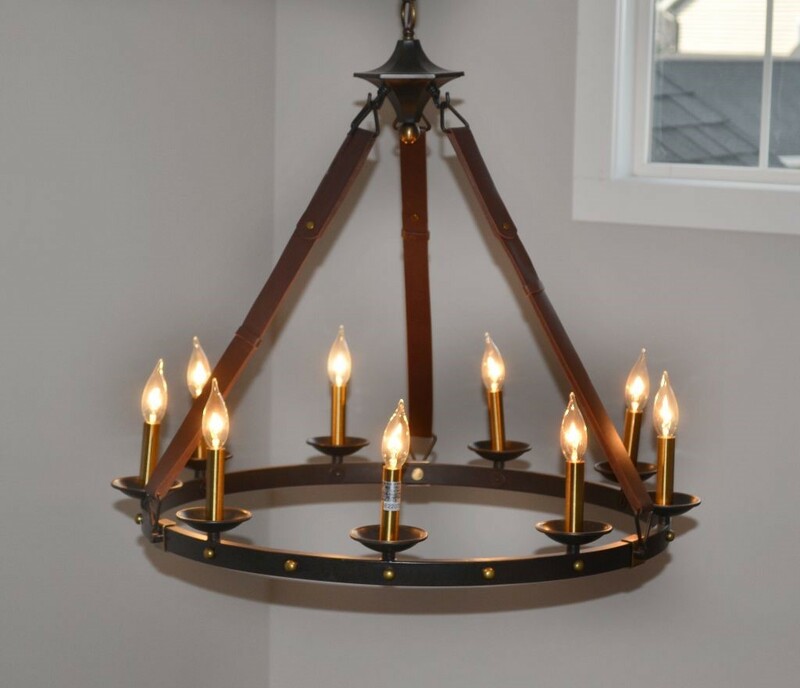 Choosing those were also at the end of the process, so by that time, I was burned out from making choices, so I just picked from the catalog simple fixtures that I “kind of liked”, but in hindsight, didn’t really love. In hindsight, I know that I shouldn’t have settled for something when I knew it wasn’t exactly what I wanted. 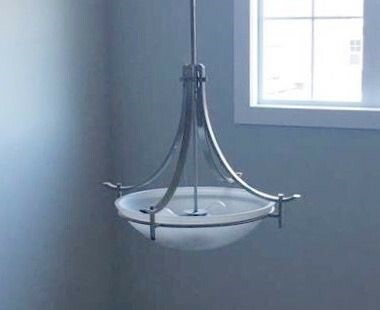 (Later, I realized that I should have told the builder to give us a credit and I would choose my own lighting elsewhere… one of the many lessons we learned from building our first house… I will save the rest of those stores for another day). The moral here is, don’t pressure yourself to make choices if you are not ready. I talk to a lot of people that say they really just don’t know where to begin in decorating their home. So, what usually ends up happening is that they do nothing, and never truly experience the feeling of joy that can come from creating the space that is right for you. In the end, it comes down to what makes you happy, and layer those items in your home, to work with you, and your lifestyle. Just start small, and over time, you will cultivate a space that you love.